Find out all about Year 2 at Homefield Primary School. First we made collagraph prints inspired by the abstract art of Kandinksy and Mondrain and then we made coil pots out of clay! They are all looking fabulous and the children have learned some great new skills as a result! In English we have begun shared-writing a formal letter to Mr Young. I have been impressed by the children's vocabulary and how we are using the model text to help us write this new letter! Keep it up as we will be using this shared write to innovate our own letters! In Maths we have been finding 1/2, 1/4 and 1/3 of shapes and objects and I was pleased to see how much we'd remembered today when we had to shade 3/4 and 2/3 of a shape too! The secret word is denominator. I have set another spag.com homework this week to be completed by Thursday 28th March. I have written it on the blackboard in the window of the classroom too and have nagged the children to tell you! For parents and carers: Thank you to the parents who came to the KS1 SATs meeting yesterday. I hope you all found it useful. ! For those that were unable to attend I have attached the PowerPoint I used for your information. I have also attached the Teacher Assessment Framework (TAF) which is a checklist of objectives for Year 2 children to achieve by the end of the year which is what they are assessed against based on the whole year's work. If you have any questions, do ask! I haven't spoken to the children about SATs yet but when I do it will be that they are doing Secret Agent Training set by the government and they will be working with the teachers complete their tasks over a few weeks and will recieve a prize at the end of them for their hard work. I do not want them to feel it is something to worry about as it isn't and they will be prepared enough to feel they know what to do as we are already working towards this! Another week has flown by! We have now finished our Geography topic and can now name the continents and oceans of the world and explain what they are, and we can also use maps, make keys and explain why people use maps and how. Phew! Maybe your child can plan your next car journey?! We have been exploring formal letters in English and can now identify their features. If you have any books with letters in or any letters you are happy to share, please bring them in! We have also focused on suffixes (particularly -less, -ness, -ly and -ful) and I have set a spag.com homework that can help with these suffixes and more! I have given the children a slip to explain the homework and it also has their username and password on. If you need any help with this, just ask! In Maths, we have started looking at fractions, thinking about them being equal parts and how this links with our knowledge of division. We will continue looking at fractions over the coming weeks, focusing on halves, thirds and quarters. Our next topic is art and we will be looking at sculpture using clay and collagraph printing. I will send home a knowledge organiser on Monday to help with your child's understanding. The secret word is collagraph. Have a restful weekend and enjoy the Fashion Show on Saturday! Welcome back! I hope you all had a great half-term break! We have been on fire this week learning to tell the time and I was so impressed with how EVERYONE progressed this week that I just had to give you ALL the Growth Mindset award! You are amazing and I know you are all looking forward to being the Time Master of the Day (with our very own snazzy class watch) who is responsible for telling us what time it is and asking adults to ask them what the time is around the school. a squirrel squeaking in my ear. a squirrel staring back at me! We have started our new Geography topic of becoming 'Map Masters'! We have already explored the five oceans and seven continents that are in the world using atlas' to help us. Why not ask your child if they can name them? We will be looking at maps of the local area and keys which tell us what is on the map next week. Perhaps have a look at some maps at home and see what you can spot? The secret word is globe. Is it really half-term already? Where has the time gone! This week, we had our last gymnastics lesson with Mr Carr using the equipment. The children really loved using it and demonstrated some great core strength, balance and movements! PE will go back to being on a Thursday and Friday after half-term so make sure you have your kits ready! We have loved exploring poetry this week. We have spotted where the rhyme is in poems, any repetition, alliteration and talked about verses being a change of idea. We enjoyed sharing our favourite poems, and especially liked one of Miss Everett's favourite ones - Strict by Michael Rosen! It was very funny! We worked in groups to perform a poem today called The Mud-Maker's Rhyme by Janet Paisley. We had to use our voices in difference ways to show expression, include actions and use our faces too! The children did such an amazing job, I put them all on gold! In maths, we have continued to explore division as sharing, answering word problems and making sure we could record our working out in a clear way and also be efficient with our method! It was lovely to talk to all of you at parents' evening this week and I said that I would send home a recommended reading list for Year 2 of books that are appropriate for this age group. I have attached the document below should you want to head to the library over half-term to explore some of the titles! I hope you have a great half-term and come back ready and enthusiastic to learn even more! What another busy week! The children had a few mid-term assessments this week and worked so hard! We definitely learned to read the questions carefully but the children have demonstrated their learning well :) Well done! We have started learning about Great Yarmouth's tourism history and were amazed at how old some of the buildings and attractions really were after we tried to put them in time order! We also put ourselves in a tourists shoes, writing a postcard as someone from 100 years ago who had never been to the seaside before. We were shocked that men and women couldn't bathe on the beach together as it wasn't seen as appropriate! This week we have been learning about division and odd and even numbers. We investigated which numbers could be split equally between two groups, spotted a pattern and made a rule. We now know that even numbers are numbers which can be split equally between two groups and the ones digit will always end in a 0, 2, 4, 6 or 8. An odd number cannot be shared equally between two groups and the ones digit will always end in a 1, 3, 5, 7, or 9. If you would like to bring in your favourite poem on Tuesday, we are looking at different 'sense' poems next week. I love poetry and think it can be a lot of fun, uses great vocabulary and love how it makes me feel! We will be aiming to write to entertain people with our poems too! The secret word is onomatopoeia! I look forward to seeing you all next week for parents' evening, any questions, just ask! Wel done to all the children in Year 2 who took part in the gymnastics competition on Wednesday. I heard only positive things about you all and you should be proud of your fantastic efforts! Ms Studley has posted more about the event in the Sports Blog on the website so go and check it out too! This week, we have been doing some great scientific thinking, from planning and carrying out an experiment to test if older children have bigger hands, to matching up animals to their young, to writing instructions about how to grow cress and deciding what foods are good for us! We have done some great thinking this week. In english, we have been writing our own Tunnel stories and we have got some lovely expanded noun phrases and veb choices so far! We will be moving onto poetry next week, so get those poetry books out at home and indulge! In maths, we have grown into multiplication masters, seeing multiplication as groups of things and using arrays to help us see these groups, drawing them , matching them up, spotting the odd ones out and solving a puzzle! Keep up the good work! We start our new local history topic next week, aiming to answer the question 'what made Great Yarmouth great?' Why not get talking to older family members and friends who may be able to tell you more about what Yarmouth used to be like when they were younger or even what their parents experienced! We will be looking back to when Great Yarmouth became a popular destination for tourists and what attracts people there even to this day. The secret word is Victorian. The children impressed me with their gymnastic skills in their first lesson with Mr Carr on Monday. They remembered lots from last year and will learn lots more this year, I'm sure! We also had a PE enrichment session learning all about parkour. The children all came back buzzing from this great experience and it was great to try something new. We have been loving reading The Tunnel, predicting the surprising ending and writing great expanded noun phrases about the dirty, damp and endless tunnel. Then we read the mysterious book, 'The Garden of Abdul Gasazi' and loved that too! We noticed how the books were similar and enjoyed discovering links between the two. We are looking forward to writing our own versions next week! We have started to become money experts! We are feeling more confident making the same amount in different ways, solving problems with money and working with pounds and pence together. Please keep this up at home where you can as it's a great, useful skill! The secret word is multiplication, as we will be starting multiplication next week, thinking about groups of things and how many there are altogether. We have also enjoyed our new science topic about plants. We already knew what plants needed to grow (light, warmth, water, soil/nutrients) so we set up an experiment to find out if the plants could grow without two or more of those things. We can't wait to find out if and how they grow! We also have become experts in the life cycle of a bean plant (that grows from a seed) and a tulip (that grows from a bulb). We now know that germination is when the seed begins growing. Keep warm and have a cosy weekend! I hope you all had a fabulous Christmas and a restful break. It is lovely to have you all back and so ready to learn! Just a few admin points: I know most of you have seen or been told by the children that we are starting gymnastics lessons with Mr Carr on a Monday so please make sure PE kits are in school! I will also be handing homework out on a Monday to be in for the following Monday. I will be sending more maths problems, reading questions and grammar challenges home to help secure and stretch the children's thinking. If you have any questions about these, do ask! I'm always happy to help at school as well if doing homework at home is difficult. Just let me know! We have started reading this book in English. 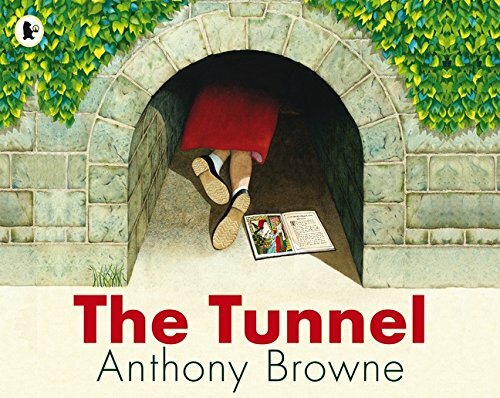 We are really enjoying it and have been thinking about if we would go through a mysterious tunnel ourselves... We have thought a lot about the characters, exploring their differences and feelings. We have also written some advice for Rose about whether or not we think she should go through the tunnel to find her brother and how she can stay brave even though she is scared. We began thinking about describing what the tunnel is like and we will continue describing it next week and can't wait to find out where it leads! In Maths we have been exploring money. We can recognise and count coins and notes and find the difference between amounts. We will be extending our thinking to pounds and pence, how we can make the same amount in different ways and thinking about the real life context of working out how much things cost altogether and what change we might get, as if we were in a shop. It would be great if you could try this at home too... I'm sure the children will be sorting finances in no time! We have started and now finished our short Programming topic and the children have enjoyed programming Bee-Bots to get from A to B, some even having to avoid obstacles. We wrote algorithms to help some animals find their way back to their families and if we made a mistake, had to debug them to correct them. The children were great at this and it really helped us remember our lefts from our right! We will be starting our new Science topic about plants. I wonder how much you already know? Can you explain how a plant grows? Can you tell me what a plant needs to grow and stay healthy? It would be great if you could come in on Monday with some ideas... perhaps a few team points might be rewarded! The secret word is germination. Well what a busy week it has been and may I start by saying how proud I am of you all, especially with how polite and well-mannered you were when our special visitor came this week (though I knew you would be!) but also with how well you tackled sewing on Thursday. For most of you, it was the first time you had ever sewn and my goodness you were all amazing! I just had to give the whole class the Growth Mindset award this week because of it! Speaking of sewing, we are making hand puppets sell at the Christmas Fayre and I sent home a little homework this week to do some 'market research' to investigate which Christmas character would be the most popular to sell as a hand puppet. This is due on Monday so we can make some decisions about what to make for you, so please have it on Monday ready. The secret word is cautiously. We have finished our recounts now in English and moved onto instructions - another non-fiction text which is meant to inform the reader. We have already noticed they have some similar features to recounts, like time conjunctions, and are going to be delving deeper into more features next week. In Maths, we have been working out how to find 10 more, 10 less and multiples of 10 more or less to (like 20, 30, 40 etc). We noticed that on a hundred square these were directly above and below the number and that it is only the tens column that changes as we are adding no ones! Tomorrow is a busy week, making our puppets, continuing with our Christmas play rehearsals and then Decoration Day on Friday! Keep your eyes peeled for a sign up sheet next week if you would like to help on Friday. Enjoy your weekend and we'll see you on Monday! We had a great start to the week with a visit from Charlotte who works at Banham Zoo. She bought 5 of her friends with her: 2 Madagascan Hissing Cockroaches, 2 African Land Snails and a Bearded Dragon! We learned a lot about how the animals are adapted to their environments, meaning they have special parts on their bodies to help them survive in their habitat. Did you know a Bearded Dragon has a hole all the way through his head where his ears are to help keep him cool in the desert? The children used some great vocabulary and seem to be really enjoying this topic! Check out more photos in the photos section of Homefield's website! In English, we have been picking apart recounts and learning about how they are structured and what ingredients go into them like time conjunctions (first, next, then, when, finally etc) and other conjunctions (and, because, but and so); first person pronouns (I, we) but can also use the third person (he, she, they); and exclamation sentences. We also know that they need a title, introduction (who, what, where, when, why), main body (paragraphs in time order) and conclusion (last thought). The secret word is chronological. It has been a lot of information to take on but we are enjoying the challenge! In Maths we have been thinking about related facts like if I know 7+3=10 that 70+30=100 and we could prove it using denes. We also were practising solving balancing calculations like this: 4+5=2+? If we know 4+5=9 then we need to know what we could add to 2 to make 9, so the missing number would be 7. We know that the = sign means balance and the same as. I was very impressed by how well the children showed their respect at our Remembrance Service on Thursday too, you were a great credit to the school. Don't forget to do your Spelling Attack homework for Monday and your Science homework for Friday- I look forward to seeing them all! As ever, have a lovely weekend and I look forward to seeing you on Monday. Welcome back! I hope you all had a lovely half-term and are feeling rested and ready to tackle all the challenges of this half-term. I hope you all enjoyed the art gallery on Tuesday and could see the progress the children had made from start to finish. We have started a new english unit of work, this time focusing on Non-Fiction texts and we will be therefore writing to inform. We have started looking at recounts and their features as we will be writing our own recount of our animal encounter experience on Monday 5th November, when animals and bio-artefacts (furs, feathers, skins etc) from Banham Zoo will be coming to school! We are all very excited about this! This links with our new science topic - Living Things and Their Habitats. On Monday, I sent home a knowledge organiser with the key words and ideas that we will be covering in this topic for you to discuss with your children, so please make good use of it! We have already started learning about the different types of habitats in the world and what makes something alive, dead or never alive. I have set this week's homework to be a research task to find out about one of the habitats and tell me what plants and animals you would find in it. This can be presented in any way you would like and doesn't have to be in for 2 weeks as it is a heavier task! We have also started learning how to write letters in the pre-cursive (with lead-ins and outs to the letters) so that we can make sure we are forming our letters properly before we start joining them properly. The secret word is paragraphs. A few of you have been asking me about things to do at home with your children. Hit the Button (https://www.topmarks.co.uk/maths-games/hit-the-button) is a great way for your children to practise number bonds, addition facts and subtraction facts and will help their recall to become speedier as these quick links between the numbers is a vital foundation for other areas of maths. Also, Reading Vipers (https://www.literacyshedblog.com/uploads/1/2/5/7/12572836/ks1_reading_vipers.pdf) are a great resource for questions you can ask your children about their reading books to develop their comprehension, ability to retrieve information, understand vocabulary, predict, make inferences, sequence information and make links between other things they have read. Again, these are vital skills that really help secure the foundations of reading beyond decoding. It would be really helpful if you could comment on your child's understanding of the text in the comments section of their reading diaries to show their understanding of what they read, not just how they read it.